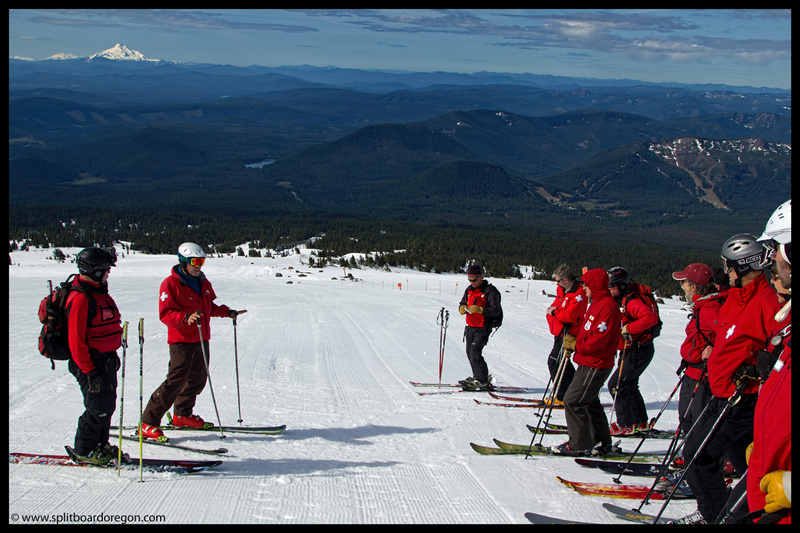 After taking a reign check the last couple of years, I decided it was finally time to head up to Mt Hood and check out the Nuts and Bolts clinic sponsored by the Pacific Northwest Division of the National Ski Patrol. Plans were made to head to Gresham with my wife and boys on Friday night, ride on Saturday, and then visit with family Saturday night and Sunday. Conditions looked good on Friday, as several friends who were at the mountain confirmed with pictures posted on Facebook of sunshine and fresh snow. On Saturday morning, I left early and headed up Highway 26 after a hasty breakfast. 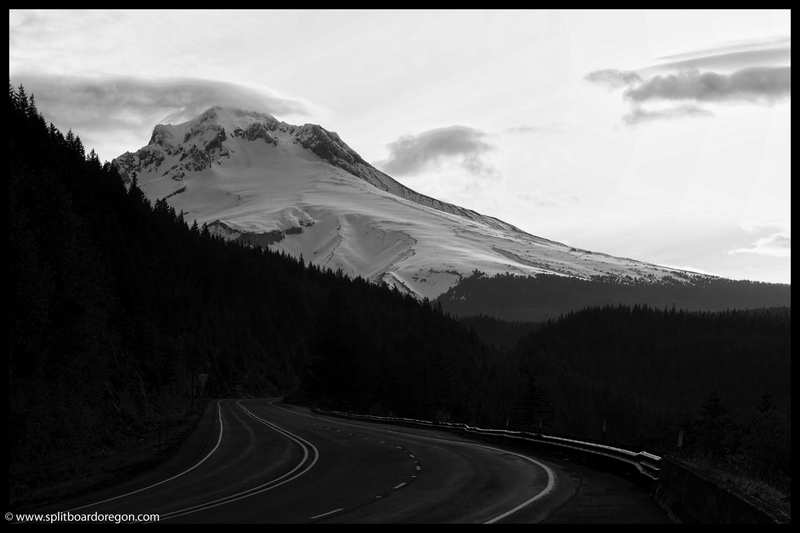 Being a bit early, I stopped along the highway prior to Government Camp and snapped a few photos of the mountain in the early morning light. The below photo in black and white proved to be my favorite…. By 7:15 I was sitting in the Timberline parking lot watching a lenticular cloud on the mountain’s upper slopes flirt with numerous climbers coming down off the Hogsback. By 7:30, I was geared up and ready to go, heading for the Wy’East day lodge to listen to a brief presentation on the day’s events. There was a morning raffle, highlighted by the Fuxi rep giving away a number of different items. Then, it was time to get on the slopes and have a little fun. 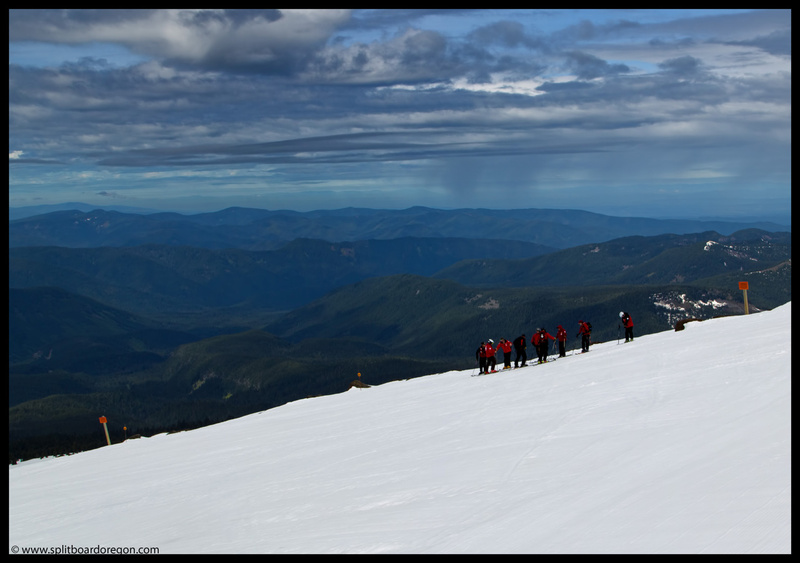 I ended up in the instructor tool kit for sleds and toboggans, along with fellow Willamette Pass ski patrollers Ian, Jeremy & Jim. 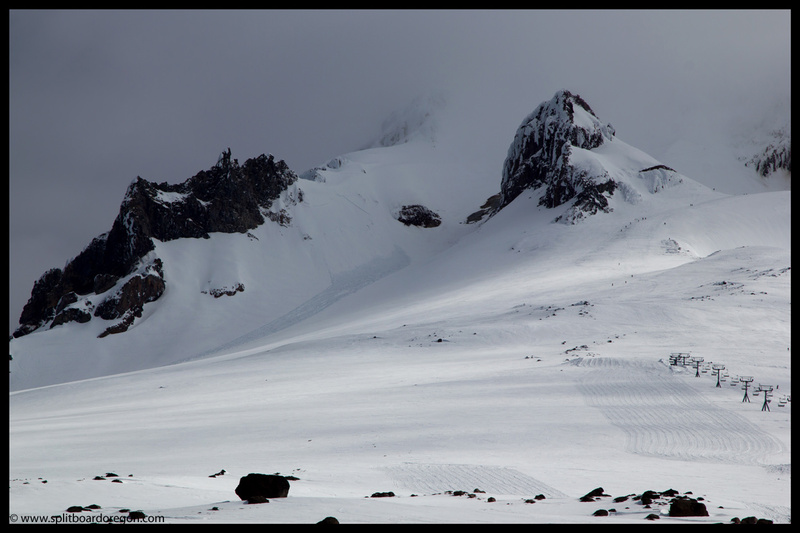 One thing I noticed initially as we rode up the Mile Chairlift was the crown face and associated debris in the west crater route from the previous snowfall…. The morning started off with a number of drills related to sled handling, including much discussion about proper stance, weight distribution for running sleds, etc. We also discussed learning styles a bit, which I found interesting. The upper mountain became enshrouded in clouds from the mid-Palmer level up, and at one point it even rained on up for a few minutes, but for most of the day the weather was pleasant and sunny like the below photo shows…. One interesting drill we did involved laying 6 or 7 ski poles perpendicular to the slope about 15 feet apart and then jumping over them in succession. On a board, this is easier said than done, but doable. The first few poles are easy to ollie over, but the last couple much more difficult due to the speed one builds up without being able to speed check! After drills, we pulled out the Edge sled for a bit of play time before wrapping up the clinic by 12:30 so we could head off and free ride for the remainder of the day. Next year I think I’ll spend a couple of days on the mountain during the clinic, and take advantage of the easy access to the southside routes with lift assist from the Palmer. The upper slopes around Crater Rock and Illumination Rock were looking pretty tasty. Unfortunately for me my day came to an end shortly after the training was over, as I broke my carbon fiber highback on my binding. It wasn’t all for not though, as I’d already had a good day and was able to spend a few more hours with the family. 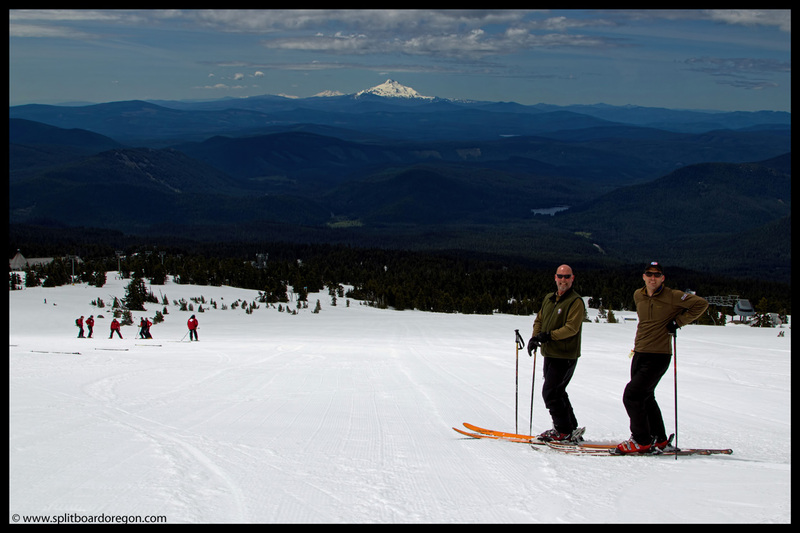 Here’s a parting shot of Willamette Pass ski patrollers Joe and Kevin enjoying a day of lift served riding at Timberline in June!